The animal kingdom is full of cons – shapeshifter who have learned that to survive, they need look different or mask their appearance altogether. Everyone’s heard of the chameleon, a distinct species of lizard with the ability to change colours and easily blend to his environment. He’s not alone, though, and frankly he’s not even the most interesting. Mimicking, I find, is a more creative evolutionary path. For instance, the hawk moth caterpillar morphs to resemble a snake in order to scare off predators. What about mimicking and camouflage together? There’s something even better. Meet Boquila trifoliolata – a vine native to Chile and Argentina only recently discovered and described by biologists. This remarkable vine is like no other plant, and distinguishes itself by the cunning ability to morph its leafs around those of host plants that grow near its branches. Just check out the photo above and prepare to become amazed. The blue arrows indicate the host plant, while the red arrows indicate B. trifoliolata. What you’re seeing is the vine’s leafs changing in shape, color, size and orientation in response to the host plant. 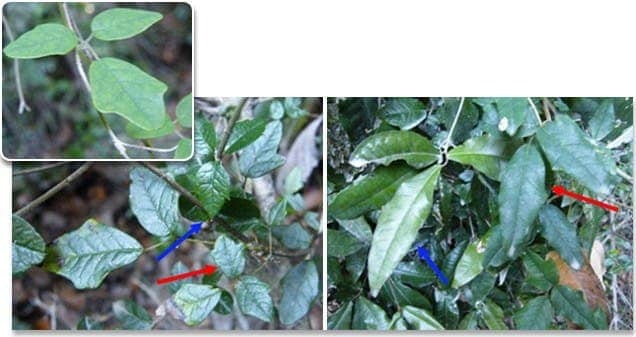 In the second photo, the vine leaf grow to 10 times its normal size to resemble the host leafs. According to the researchers, the B. trifoliolata may have adapted this ability to avoid being eaten by herbivores. It’s unclear, however, how the vine knows how to mimic trees in its vicinity. It may be able to pick up chemical odors or microbes may transport gene-activating signals between the fraud and the host, the researchers hypothesize. While other plants or animals mimic a single host, this amazing plant is able to do so for multiple hosts. This ability is called polymorphism, and B. trifoliolata is the only plant in the world know so far capable of it.